With help from the 2018 BioTreks Production Team. Panama disease, caused by the fungus Fusarium oxysporum f. sp. cubense, specifically the strain Tropical Race 4 (TR4), is a pathogenic fungus that is driving Cavendish bananas to extinction. The same fungal species, but a different strain (TR1), drove the beloved Gros Michel bananas to near extinction in the 1960s. The goal of this research is to create a means for detecting the pathogenic fungus F. oxysporum f. sp. cubense TR4. Detection of this fungus in fields prior to their planting with bananas is crucial to stop the spread of the disease. Detection is important because Cavendish bananas are one of the most consumed fruits worldwide and currently the cheapest available for sale. Their low price is due to the efficiency of breeding bananas that are all genetically identical; however, as can be seen currently with the threat posed by Panama disease, their genetic homogeneity may also be this banana’s downfall. The method chosen to detect fusarium wilt is to create a functioning toehold switch, which will transcribe green fluorescent protein and glow green when F. oxysporum f. Sp. TR4 is present. Authors are listed in alphabetical order. Anna Minutella mentored the group. Please direct all correspondence to aminutella@renaissanceschool.org. Download a printable PDF version of this article. This is an Open Access article, which was copyrighted by the authors and published by BioTreks in 2018. It is distributed under the terms of the Creative Commons Attribution License, which permits non-commercial re-use, distribution, and reproduction in any medium, provided the original work is properly cited. The Gros Michel, or Big Mike, is a variety of banana that was enjoyed by people all over the world. The popularity of this banana boomed after the United Fruit Company (UFC) introduced the Gros Michel to the world (Kramer, 2016). The Gros Michel was known as the most popular banana variety until the Standard Fruit Company introduced the Cavendish banana, which is the type of banana found piled in grocery stores today. In the 1950s, however, the Big Mike banana was facing extinction due to Panama disease, now recognized as being caused by the fungus Fusarium oxysporum f. sp. cubense, Tropical Race 1 (TR1) strain. Interestingly enough, the Cavendish banana was resistant to this form of Panama disease. It did not take long before the Cavendish’s popularity began to rise, being dubbed the most popular banana variety by the 1950s (Kramer, 2016). Although the Cavendish banana has resistance to the TR1 fungal strain, it has no resistance to a new form of Panama disease, caused by a different strain, Tropical Race 4 (TR4), and Cavendish plants around the world are now being affected by this fungus that cannot be cured (Szal, 2015). Cavendish bananas make up the majority of the current global banana market. Sadly, the banana industry is plagued by this incurable disease and worried about the economic consequences that may follow the possible demise of the Cavendish banana. What makes this banana so prone to infection by TR4 is the lack of diversity among banana plants (Fessenden, 2015). Cavendish bananas are sterile, so the plant must be cloned through the use of cuttings in order to produce new plants (Kramer, 2016). In 2012 the University of Florida’s Food and Resource Economics Department on the Banana Market, produced a series where they discussed the world market of bananas. In this report, Edward Evans and Fredy Ballen discussed the importance of bananas to the world market. The total amount of bananas produced by the world in 2009 was estimated to be 97.3 million metric tonnes. This was a 49 percent increase compared with the production of bananas in 2000. The Evans-Ballen article showed that banana production is a booming industry and has a very large global market. The biggest consumer of bananas is the US, where per capita consumption is approximately 11 kg of bananas per year (Evans, 2010). Although the efforts to stop the spread of this fungus have previously failed, Ordonez et al. (2015) may have provided an important lead: this article includes the genetic makeup of F. oxysporum f. sp. Cubense (Foc), the disease-causing agent of Panama disease. The current pathogenic strain infecting Cavendish bananas is known as Tropical Race 4, which was first identified in Taiwan in the mid-1990s. The extent of the threat this pathogen posed to bananas was underestimated until it had spread to both local and regional banana crops. Foc TR4 strain II-5 is an asexual haploid pathogen whose spread was favored by the monoculture of Cavendish bananas, and which has proven impossible to control (Ordonez et al, 2015). Since Foc is very difficult to eliminate from banana crops, the ability to detect the fungus in fields is critical in helping to control the spread of the disease. Perez-Vicente and colleagues (2014) discussed protocols for the molecular identification of F. oxysporum f. sp. cubense in bananas. One method for detecting Foc is by using the polymerase chain reaction (PCR) technique, which has improved molecular biology tremendously. PCR enables researchers to take a segment of DNA and amplify the strand so that further analyses can be performed on the DNA. Researchers thought that PCR could help to amplify DNA found in banana fields, to determine if Foc was the causative agent of disease. However, PCR is timely, costly, and cannot be performed by many farmers in areas where Foc is prevalent. In 2016 a method was described for the apid, low-cost detection of Zika virus using programmable biomolecular components, known as toehold switches (Pardee et al, 2016). The goal of their project was to create a product that replaces the high cost, complicated methods used to detect viruses that spread rapidly. To do so, Pardee and colleagues linked isothermal RNA amplification to a toehold switch to detect “clinically relevant concentrations of Zika virus.” Toehold switches are programmable RNA sensors that can sense and bind practically any RNA sequence. In addition to this, toehold switches regulate or control the translation of a gene via the binding of trans-acting RNA. Toehold switches contain hairpin structures, which block the translation of genes in cis by the isolation or the sequestration of the ribosome binding site (RBS) and the start codon. 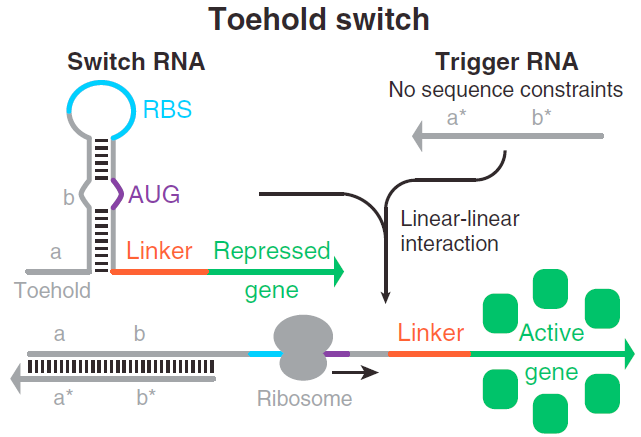 Once a switch binds to a complementary RNA sequence, the sequestration is ended, activating gene translation. In order to make a toehold switch, it is necessary to find a hairpin within the DNA sequence that contains both the RBS and the start codon, AUG. 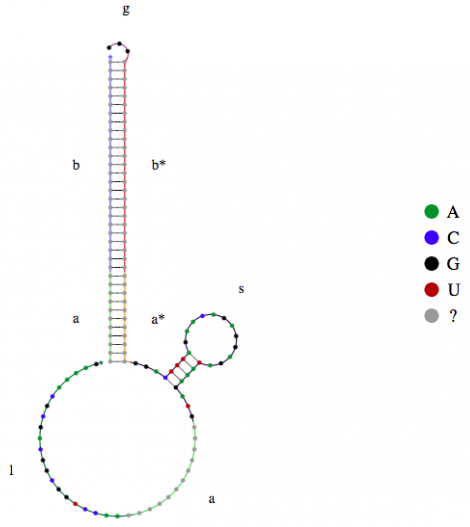 In order to see the exact structure the hairpin will form, it is necessary to use some basic coding in a website called NUPACK (Nucleic Acid Package) (Figure 1). 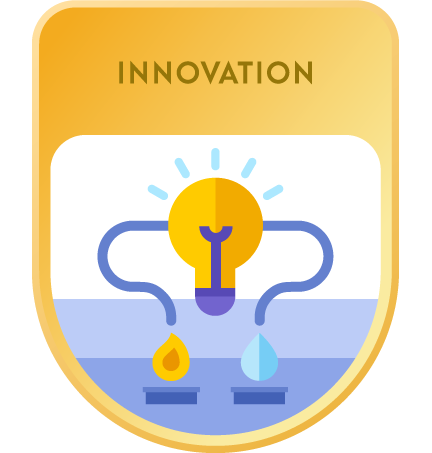 NUPACK is able to design and analyze various nucleic acid sequences, and it is specifically able to convert a genetic sequence into a minimum free energy (MFE) structure, highlighting the sections of DNA that will hairpin, and allow us to make a toehold switch. An MFE structure is a secondary nucleic acid structure that shows the lowest value of free energy, but does not necessarily occur in vivo. NUPACK is able to convert a genetic sequence into an MFE structure for a toehold switch by first translating the DNA sequence into “dot-parens” notation, which is a text representation of the MFE structure, with the dots representing the circular DNA and the parentheses representing the hairpins (open parenthesis for the left side of the hairpin, closed parenthesis for the right side of the hairpin). Figure 1. The MFE structure of the 16S – V3 region of a gene. In order to make a toehold switch using NUPACK, the template code for a toehold switch must first be uploaded. The template was provided to us by our mentor from the Biology Department at MIT. Once this template code, or “script,” is uploaded to NUPACK, the remaining step is to replace the section of the code labelled “source rRNA” with the 96-nucleotide region of the fusarium wilt TR4 gene. This section must include both the RBS and the start codon in order for the toehold switch to function, and more specifically it must be the section of the gene going from 16S ribosomal RNA to the hypervariable region (NUPACK.com, 2018). Once this toehold region of the gene has been mapped out, it is necessary for the detection of gene expression to precede it with the genetic sequence for green fluorescent protein (GFP). GFP consists of 238 amino acids, and was originally isolated from the jellyfish Aequorea victoria This protein glows green when exposed to ultraviolet light. Thanks to the protein’s fluorescent properties, the GFP gene is typically used as a reporter gene (a gene that is attached to a specific target sequence) and then used as a measure of whether or not said sequence was transcribed,. The addition of the genetic sequence of GFP following the fusarium wilt RNA toehold allows the detection of fusarium wilt: if the trigger brinds, then the previously hairpinned gene region will open and be transcribed. Algosome Software Design provides lists of many genetic sequences that are used frequently in molecular biology, including the sequence for GFP , or more specifically eukaryotic GFP (eGFP) (Algosome Software Design, 2018). Annual world banana production is estimated to be 97.3 million metric tonnes, with the worldwide market value being approximately $8.08 billion. The majority of these bananas are produced in India, the Philippines, China, Ecuador, and Brazil, with more than 100 billion bananas eaten yearly worldwide and an average of 12.25 kg consumed yearly per person. High in tryptophan, fiber and potassium, bananas have been shown to improve mood, quality of sleep and digestion, as well as supporting gut health and replenishing energy (Evans & Ballen, 2010; Szalay, 2017). Panama disease infects fields and may lie dormant for up to 40 years. This creates a problem for farmers looking to plant bananas and not knowing whether or not their fields are disease-ridden. The currently existing means of detection are difficult to perform and are often very expensive. The toehold switch would be a more efficient, inexpensive detection system that would allow farmers to preventatively determine whether their fields are disease-free before planting. The goal of this research is to be able to create a means of detection for F. oxysporum f. sp. cubense TR4, the pathogenic fungus which is driving Cavendish bananas to extinction. This research is important because Cavendish bananas comprise the vast majority of commercially-grown bananas, are one of the most consumed fruits worldwide, and are currently the cheapest available for sale. Their low price is due to the efficiency of breeding plants that are all genetically identical; however, as can be seen currently with the threat posed by Panama disease, this genetic homogeneity may also be this banana’s downfall (Evans & Ballen, 2010). The way we have chosen to detect fusarium wilt is by creating a functioning toehold switch, which will transcribe GFP and glow green when fusarium wilt is present. As seen in Figure 2 , the toehold switch must be made at the beginning of a hairpin which contains the RBS, with the start codon (AUG) on the right side of the hairpin. The toehold is a section of RNA composed of 36 nucleotides, and in this specific case with the fusarium wilt fungal RNA inserted into the toehold switch, with 18 of these nucleotides forming part of the hairpin. Following the hairpin is a linker sequence of RNA that comes before the repressed gene, which in the case of this experiment is GFP. All these parts make up the switch RNA which – until it encounters its complementary strand – will be in an “off state,” in which it is not transcribed. Figure 2. A toehold switch mechanism. When the complementary bacterial RNA (fusarium wilt TR4) strand is present, the 36-nucleotide toehold sequence (the trigger) will bind to the bacterial gene. This turns on the toehold switch and allows the translation of the repressed gene. The GFP will thus be expressed when the toehold sequence comes into contact with the fusarium wilt gene. The creation of a toehold switch as a means of disease detection would be efficient and inexpensive. Because the toehold would be merely a tool for disease detection, the safety concerns are very limited: there is virtually no chance of a gene drive or any sort of loss of control of the mechanism. For these same reasons, the overall ecosystem impact of the toehold switch would also be very small. Through extensive research, a theoretical approach to solve a world problem was developed. This proposed detection method for Panama disease has the potential to aid banana farmers in discovering which, if any, of their fields are infected with Panama disease, and therefore where their crops would fail, which would, in turn, affect their business. The toehold switch, the means of detection, being inexpensive and having few safety risks, would be ideal for low-income areas. We would like to thank our synthetic biology teacher, Anna Minutella, for providing support and feedback. We would also like to thank our school for providing the necessary materials, and our mentor, Ally Huang at MIT, for helping us to understand NUPACK and the toehold switch. Without her, this project would not have been possible. Bailey, P. Genome sequencing may help avert banana armageddon. [Internet] Davis (CA): University of California Davis; 2016 Aug 11. Available from: https://bit.ly/2C3aOZ4. Belgrove, A, Steinberg, C, Viljoen, A. Evaluation of nonpathogenic Fusarium oxysporum and Pseudomonas fluorescens for panama disease control. Plant Dis. 2011 Aug; 95(8):951-59. CABI. Fusarium oxysporum f. sp. cubense (Panama disease of banana). [Internet] Wallingford, UK: Invasive Species Compendium; 2017 October 11. Available from: https://bit.ly/2zW0xMu. BEC Crew. New study confirms that bananas are being driven to extinction. [Internet] ScienceAlert; 2015 Dec 1. Available from: https://bit.ly/2BYIuXI. Department of Agriculture and Fisheries. Panama disease. [Internet] Queensland, Australia, n.d. Available at: https://bit.ly/2QwTlMe. Dong, X, Ling, N, Wang, M, Shen, Q, Guo, S. Fusaric acid is a crucial factor in the disturbance of leaf water imbalance in Fusarium-infected banana plants. Plant Physiol. Biochem. 2012 Nov 60:171–79. Evans, E and Ballen, F. Banana Market. [Internet] Florida (FL): University of Florida; 2012 Feb [reviewed 2018 Apr]. Available from: https://bit.ly/1nOtKYO. Fakhouri, W, Walker, F, Armbruster, W, Buchenauer, H. Detoxification of fusaric acid by a nonpathogenic Colletotrichum sp. Physiol. Mol. Plant Path. 2004;63(5)263-9. Fessenden, M. The most popular eating banana might soon go extinct. [Internet] Smithsonian.com; 2015 June 5. Available from: https://bit.ly/2PiHy47. GenBank. Fusarium oxysporum f. cubense strain NRRL 36114 28S ribosomal RNA gene and 28S-18S ribosomal RNA intergenic spacer, partial sequence. [Internet] Bethesda (MD): NCBI. 2015 May 19. Available from: https://bit.ly/2QARfeB. Green, A, Silver, PA, Collins, JJ Yin, P. Toehold switches: de-novo-designed regulators of gene expression. Cell. 2014 Nov 11;159(4):925–39. Kramer, S. Bananas looked totally different in the 1940s – before disaster struck. [Internet] Business Insider; 2016 Feb 23. Available at: https://read.bi/2y4VZ59. Li, C, Zuo, C, Deng, G, Kuang R, Yang, Q, Hu, C et al. Contamination of bananas with beauvericin and fusaric acid produced by Fusarium oxysporum f. sp. cubense. PLOS ONE, 2013 July 26; 8(7). Pérez-Vicente, L, Dita, MA, Martínez-de la Parte, E. Technical Manual: Prevention and diagnostic of Fusarium Wilt (Panama disease) of banana caused by Fusarium oxysporum f. sp. cubense Tropical Race 4 (TR4). [Internet] Rome, Italy: Food and Agriculture Organization of the United Nations. 2014 May. Available from: https://bit.ly/2hUqOCc. Ordonez, N, Seidl, MF, Waalwijk, C, Drenth, A, Killian, A, Thomma, BPHJ et al . Worse comes to worst: Bananas and panama disease—when plant and pathogen clones meet. PLOS Pathogens, 2015 Nov 9;11(11). Ploetz, RC. Fusarium wilt of banana is caused by several pathogens referred to as Fusarium Oxysporum f. Sp. Cubense. Phytopathology, 2006 Jun;96(6):653-6. Roncero, MI, Di Pietro, A Ruiz-Roldán, MC, Huertas-Gonzalez, MD, Garcia-Maceira, FL, Meglecz, E et al. Role of cell wall-degrading enzymes in pathogenicity of Fusarium oxysporum. Rev. Iberoam. Micol. 2000 Mar 10;17(1)S47–53. Singh, VK and Upadhyay, RS (2014). Fusaric acid induced cell death and changes in oxidative metabolism of solanum lycopersicum. Bot. Stud. 2014 Aug 27;55(660). Szal, A. Bananas threatened with extinction due to fungus. [Internet] Manufacturing.net; 2015 Jul 12. Available from: https://bit.ly/2yd0PO7. Szalay, J. Bananas: Health benefits, risks & nutrition facts. [Internet] Live Science. 2017 Oct 25. Available from: https://bit.ly/2tRmsPZ. Zhou, L, Powell, CA,Hoffmann, MT, Li, W, Fan, G, Liu, B et al. Diversity and plasticity of the intracellular plant pathogen and insect symbiont “Candidatus Liberibacter asiaticus” as revealed by hypervariable prophage genes with intragenic tandem repeats. Appl. Env. Microbiol. 2011 Sep;77(18):6663-75. Zuo, C, Zhang, W, Chen, Z, Chen, B, Huang, Y. RNA sequencing reveals that endoplasmic reticulum stress and disruption of membrane integrity underlie dimethyl trisulfide toxicity against Fusarium oxysporum f. sp. cubense Tropical Race 4. Front. Microbiol. 2017 Jul 24;8:1365. Algae protein, straight from the bioreactor the way mama used to make.